Succulents are the nature’s most durable plants and best friends for gardeners who love to live with greens in compact homes. 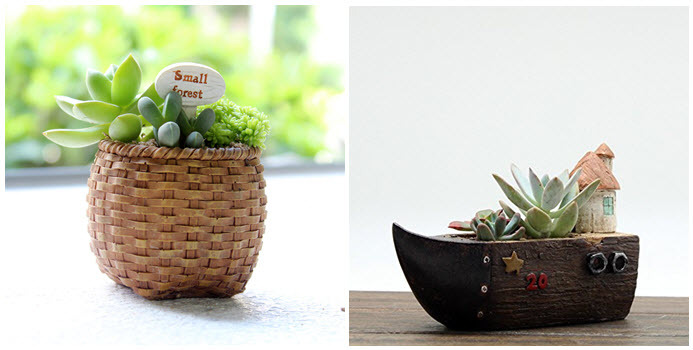 These cute small plants can be moved to beautify any space with ease. The structurally amazing plants will look strikingly attractive when grown in decorative planter pots. Check out some unique display of these sun loving dessert plants that shines a bit more in these colorful planter pots. 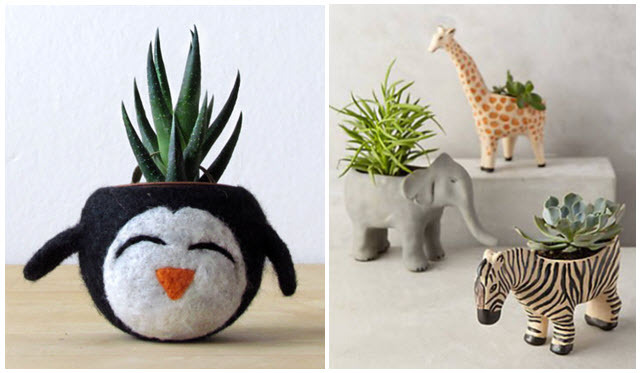 Mini animal friends with succulents for a smiley day. The happy penguin, wild wonder planter pots filled with organic soil nourishes your green friend perfectly. These colorful mini planter heads add interest to any empty spot at home. Ceramic plant bases will help you beautify these beautiful succulents. The geeky Pokémon, kitten ceramic pot creates a dramatic focal point when cornered up in side tables. These cute charming pots bring more impact to the leafy plants. Now it’s time to park the mini cooper, motorcycle miniature figurine concrete planters right indoors to create an outstanding impression to the décor. These planters are visually appealing and sturdy making them good for both mini and large plants. Modern planter pots would be an ideal choice for stylish interiors. The architectural planter pot works perfectly for small succulents. Just forget about space to grow your own plants, these are portable and adorable partners for your green friends. The wood boat makes a great succulent centerpiece for dining tables. Looks rustic with a splash of greenery what exactly your rustic theme requires. The novel wood flower pot with its mild beauty will rule the hearts just at a glance. The interestingly shaped plants will create contrast and visual vibrancy when displayed on these pots. Spiky, thorny, rough and tough admirers will love to take home the black clay spiky planter to liven up the decor. The white pottery petal planter with cute succulents is eye catching in its looks that steals the show making your décor extra ordinary. Need something unique for your little one’s room? Pick the creative animal resin planter, mini Totoro cart planter that gives interesting looks to indoors. Colorful and loaded with fun that your champs would enjoy preserving greens. Succulents would love to stay dry, so avoid over watering. Choose indoor thriving succulents like string of pearls, panda plant which can withstand dryness and thrive in dry air of heated homes. Growing succulents, cacti removes toxins from environment giving fresh air indoors. Get ready and bring home at least one green friend to stay happy and healthy.